Aboriginal Housing in Action Society was a non-profit group dedicated to improving aboriginal wellness through improving living circumstances. As the first major project of the society it was very important in establishing credibility and setting a precedent for aboriginal housing. In order to complete this project the society had to overcome many challenges from zoning, design and management. 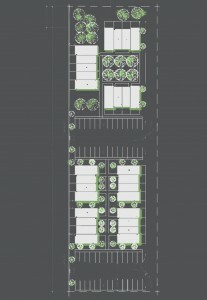 The project scope included 29 units made of of two and three bedroom housing units. By working with simple repetitive design solutions we were able to provide good quality living spaces that tendered for less than one hundred dollars per square foot. The project went on to win an affordable housing award and set the DNA for aboriginal housing development in Alberta.